The Coast Guard has seen the number of call-outs double this summer due to the heatwave. 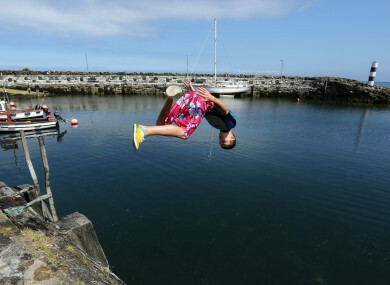 Teenagers jump into the harbour at Carnlough, county Antrim. WITH THE UNPRECEDENTED heatwave came a shocking number of drowning tragedies in one-time traditional swimming haunts across Ireland. The Coast Guard has confirmed that the number of call-outs has doubled year-on-year, with 72 incidents reported last weekend alone. Speaking on Morning Ireland today, Declan Geoghegan from the Coast Guard services said many of the swimmers were “extremely lucky” as there were “a lot of incidents…that were very close to disaster in terms of people having loss of life”. “Some were what I would call very close shaves,” he added. The Coast Guard and Irish Water Safety have urged the public to be vigilant while in the water and only to swim in designated bathing areas manned by lifeguards. He warned that fresh water is colder and doesn’t have the same buoyancy as salt water. It can also sap the body heat “very quickly”. So people should be aware that 20 minutes is a long time to be in cold water. That exposure should be lessened and people should learn to be in and out of the water for short periods of time and always stay within your depth or parallel to the shore. In light of a number of dangerous accidents over the past 10 days, the Coast Guard has called for parents not to allow children use inflatable toys or lilos while in the sea. Yesterday, the Valentia Coast Guard rescued two children after their inflatable ring buoy drifted from the shoreline after getting caught in an off-shore breeze..
“They are strictly for swimming pools in our opinion because they are too dangerous, especially for small children. You can be swept out to sea in the twinkle of an eye,” continued Geoghegan. Since the current spell of good weather began, eleven people have lost their lives in drowning accidents. The most recent victim was a 65-year-old man who was last seen swimming in the Ahenny quarry in Carrick-on-Suir on Saturday evening. If you’re going to be near water in the coming days, stay safe. Email “Many weekend swimmers 'very close to disaster' as Coast Guard called to 72 incidents”. Feedback on “Many weekend swimmers 'very close to disaster' as Coast Guard called to 72 incidents”.